I Can’t *cough* Bear It Any Longer! I Have Been So Wrong About the Neanderthals. How Can I Go On? At Gorham’s Cave the archaeologists have finally gotten to the bottom of their site. And imagine what they found on the bedrock floor of the cave. I’m gobsmacked. Imagine. All this time I’ve been thinking that the Neanderthals were dummies. This has completely turned my worldview on its head. Gorham’s Cave was a Middle Paleolithic Iberian artesaneria! It’s clear from the energy it took and the location of this inchoate expression of the creative germ: the Gorham’s Cave Neanderthals must have been all about the PROCESS of the art, and not the PRODUCT. How much more honest, as artists, those Gorham’s Cave Neanderthals must have been—than you or I could ever hope to be—to have valued their PRODUCT so little that in a matter of a few weeks the combined detritus of plucking feathers from dead, black vultures and the litter from countless pigeon feasts had almost certainly obscured their work, thus ensuring that it would remain forever unseen—but not forgotten in Neanderthal art circles—for posterity, if not for oblivion. How forward-thinking of them to make all of this sophisticated geometric art on the FLOOR of their home! They were so avant-garde they approached the post-garde! Later bipedal apes—the ones with the bona fide cognitive capacities—put all their art on the walls of caves, where it couldn’t be shat on, or be rapidly covered by naturally accumulating dust and dirt. 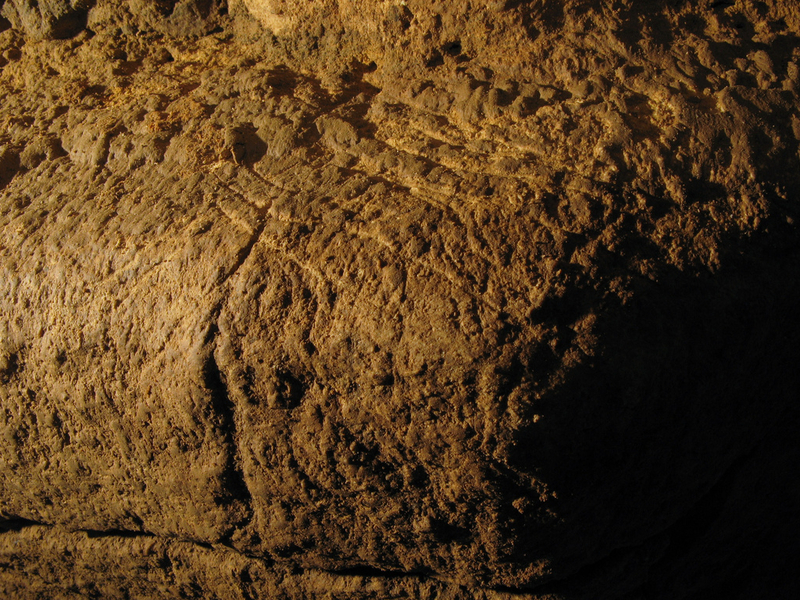 Artistic genius surely had its roots in the Middle Paleolithic of Gibraltar. 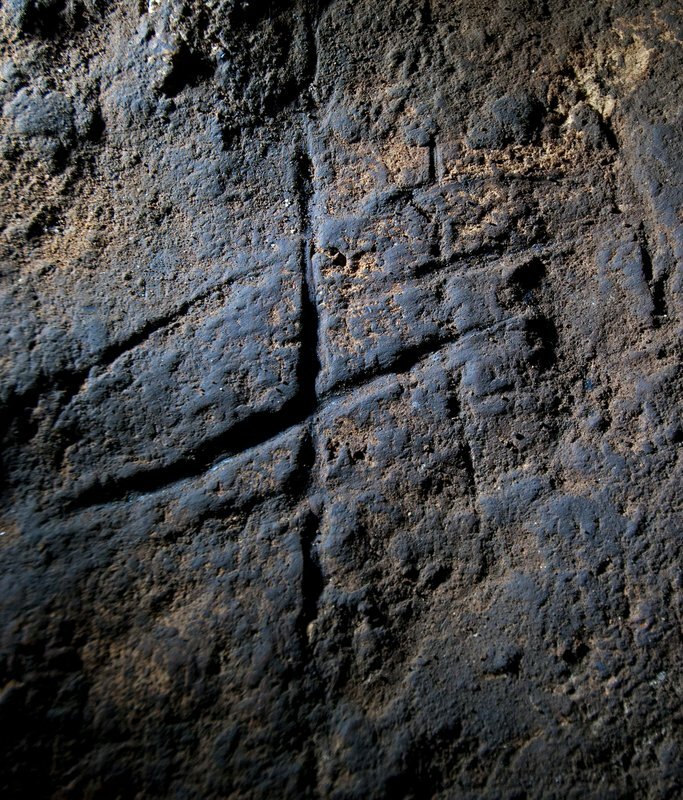 No doubt, there’ll be nay-sayers who’ll point out that there is a well-documented record of cave bears having made identical markings on the surfaces of caves in which they hibernated, from Iberia to eastern Europe, and everywhere in between, to say nothing of everywhere else in the world where bears have hibernated in caves. But I ask you, who couldn’t tell the difference between those bold statements on the floor of Gorham’s Cave and these futile faunal failures from Wells Cave, Orange County, Indiana (photo courtesy of Elliot Stahl)? I mean, really! There’s no comparison. Just ask the PNAS editor, Erik Trinkaus, Washington University in St. Louis, St. Louis, MO. He would know. Really. A biological anthropologist; why wouldn’t he know? Disregard any bad blood that he harbours for me and my thoughts. He was and is right about the Neanderthals. So are Finlayson, Finlayson, & Finlayson. Gawd that felt good! I feel all refreshed. Like a cave bear with a lotta pent-up energy. My eyes are clear at last. What a wonderful Paleoltihic world I behold. It’s like . . . Wonderland. And I, the Mad Hatter. I was just checking out the latest from Paul Krugman, and was, as was he, quite taken by these two minstrels, Rodrigo y Gabriela, here filmed in a Moroccan deli in Paris. Fascinating and irresistible. Enjoy.